Don’t Miss: The chance to visit the south western-most point in Portugal! Follow in the footsteps of some of Europe’s greatest explorers on this fascinating half-day tour. Discover the city of Lagos, home of the ‘Portuguese Discoveries’, visit Sagres and explore the famous Cape St. Vincent - the south-western most point in Portugal - and much more! Explore Lagos, home of the ‘Portuguese Discoveries’. Visit the Antonine Museum, which is located within the Golden Chapel of St. Anthony. See the beautiful bay at Ponta Da Piedade and stop in the fishing village of Sagres. Visit the lighthouse at Cape St. Vincent on the south-western most point of Portugal. Visit two of the Algarve’s most interesting and significant cities in the space of half a day! The first stop on this tour is Lagos, home to the ‘Portuguese Discoveries’. It’s from here that expeditions first set sail to chart Africa and India in the 14th and 15th centuries. Find out more about this historic location on a visit to the Antonine Museum, which is located within the Golden Chapel of St. Anthony. While in Lagos you’ll also see the slave market and the statue of ‘Prince Henry the Navigator’ who sponsored many of the expeditions. Next you’ll travel to Ponta Da Piedade to enjoy the spectacular views of the bay, before continuing to the beautiful fishing village of Sagres. 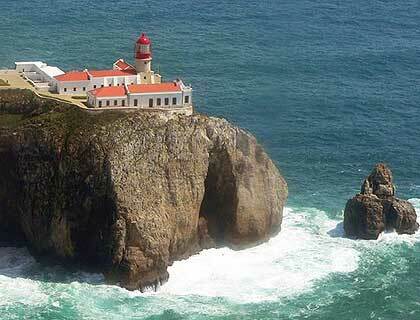 From here you can visit the lighthouse at Cape St. Vincent, which is the south-western most point of Portugal. Lagos Sagres and Cape St Vicente Tour - From Algarve is rated 4.0 out of 5 by 1. Rated 4 out of 5 by Tich from lovely scenery Enjoyed everything was as expected apart from the journey transferred to a large bus then picked up from resorts on route found the journey far to long.